The world is being made anew in this mysterious, awe-inspiring twentieth century. A new consciousness of the wholeness that is man is being developed, a consciousness almost hierarchical in its scope, inasmuch as it accepts the existence of several levels of being and reinterprets all things in terms of these levels and of the effort which mankind as a whole and in its individuals is constantly making to shift its focus of being from one level to the next higher. It is not enough for us who would plumb the depth of man to accept ancient interpretations and let our mind dwell in the old mansions built by our ancestors. It has been said that in every age the depth of a civilization could be evaluated by inquiring into the profundity of its grasp of this most essential of all concepts, the concept of the self. Today more than ever we need a revaluation of the concept of selfhood, a deepening and extension of it so that a new and ordered inclusiveness may take the place of the exclusiveness which was patent throughout the Christian era. Thus the significance of the idea of "level". From it a new inclusiveness and a new sense of ordered development of the principle of individual selfhood may be derived. The man's ego may be seen not as a static unchangeable reality of a metaphysical character, but as a functional center of being growing through its very functioning in scope, depth and significance; growing progressively through measured and meaningful steps, which may recur in cyclic series if life be fulfilled at every step. Such steps vary obviously with every individual, inasmuch as every man lives through phases of experience which in a sense are unique and never duplicated. Likewise the exact relationship of the stars and planets in the skies can most assuredly never be duplicated. In even such a small factor as the oscillatory motions of the poles of the earth it seems doubtful that the poles should ever return exactly to the same position, so complex is the interplay of elements involved in their movements. Nevertheless the unique individual must pass on his way to death or immortality through portals which are identical in racial significance. Men may decorate the walls of their dwellings in unique ways as they move from one mansion to another on the road to perfection; but the mansions are there to be inhabited by each and all. The fine lines which the bare feet make upon the sands of life are different with each individual, but the steps are the same — if they be taken at all. And some never progress beyond the very first steps. It is to such collective and generic factors that symbols apply — and perhaps nothing but symbols may ever truly apply. Because where the intellect attempts to reduce these large factors to definite laws and rigid formulations, there the very essence of these factors may be lost irrevocably. Even the most collective, and thus apparently the most objective and measurable, elements in the progress of the human being are still living factors. They may be not at all individual, and thus not to be influenced basically by individual fluctuations; nevertheless they are factors of experience. Numbers and categories are not elements of experience. But the type of symbols which we encounter in astrology, or in all these ancient systems of life-interpretation not entirely dominated by the intellect, are drawn from facts of experience, from realities lived. The very fact that they are susceptible of many shades of interpretation vouches for their living quality. Symbols however may die the death of all memories supplanted by a fresher crop of living experiences at a new level of being. New men call for new symbols. New mansions must serve the call of new human needs. Just as the introduction of modern machines and the uprooting of the physiological earth-conditioned instincts of the modern city-man are forcing us slowly to adopt new types of dwelling places conditioned for new needs, and a new concept of the woman's function, likewise — as mankind becomes re-polarized at a more mental level of being — we must find new symbols for our basic conceptions of the self. New mansions must be built for new men. "In my Father's house are many mansions," said Jesus. But we are indeed in an age in which the very house of the Father may need to be rebuilt to fit the new generation of men fashioned by new planetary and stellar energies. It has been said that the upheaval which is making humanity reel with wars and mental conflagrations is merely the by-product, as it were, of an "initiation of the planetary Logos". 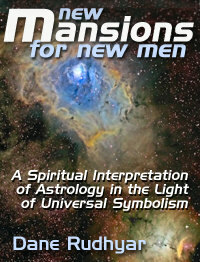 This is the occultist's somewhat cumbersome way of saying that the whole earth is moving to new fields of galactic space, that mankind is being transformed from within by the onsurge of new powers, that the Father is rebuilding His mystical house, that the Self is being known in new ways through the challenge of new relationship. It is for us, who have not forgotten that at the birth of all cycles the world belongs to poets and bards bringing new names to a race ecstatic with birthing and confused with the crashing of the old, to read the signatures which the new Ideas, that are God-born, inscribe upon the open book of the world. Thus we may be true "star-gazers", deciphering new relationships, new patterns slowly forming in that sky of all skies: the heart and mind of man. It is as poets that we write, summoning symbols that may be pregnant with futurity of meaning. We are taking the old forms of that most wondrous and most adaptable of all symbolisms, astrology, and blowing into their faded structures a new breath of life. We are making them more inclusive. We are balancing them on new levels of being in the perilous ascent toward unsealed heights of significance. We hope thereby that men may be refreshed in the experience of new images; that they may be led to experience more deeply, as they meet them, old concepts swinging in tune to new rhythms of thinking and feeling, illumined by a refreshed intuition of the goal that is man's. There are many facets to the wholeness of the perfected human being. There are many portals which man must enter before a round of experience is completed and the individual has learnt the basic functions fulfilling which he proves himself truly human. These are the mansions of astrology, the twelve mansions or "houses" into which the fullness of space surrounding man at birth is divided. In order to understand with a greater touch of reality what these twelve mansions represent we must realize the meaning of the relationship between man just achieving his first declaration of independence — the first cry — and space pressing upon him from all possible directions. This new-born babe is Life particularized, made an individual and unique entity. Space around him is Life universal, total, mother and womb all-encompassing. For this new-born infant, to live means to assimilate as much of this surrounding Life as his individual framework and character will enable him to assimilate. To assimilate; not to absorb. Mere absorption is not living experience. To experience vitally is to assimilate; to make the absorbed contents one's own, to transform and interpret them in terms of one's own individual nature and center of reference: the Self. What is absorbed but not assimilated causes physical, mental or spiritual indigestion. It poisons the consciousness. Mere awareness is not enough. Consciousness, that is, awareness referred to the individual center of synthesis (consciousness), is necessary. The process of assimilation of life-contents is a generalized aspect of the body's metabolism. Everything that surrounds us is potential food to our consciousness, even though much of it is undigestible or poisonous. Individual selfhood as an abstraction is a primary factor of being human; but in order to become a concrete reality of the inner world of the psyche the abstract "I am" must become substantial as Soul. The psyche must be fed with life-contents; its many molecular energies must become integrated as a psycho-mental organism. Man must pass through a twelve-tone gamut of experience, learning to fulfill twelve basic functions of living as a conscious, social being. The twelvefold process of development it is which astrology symbolizes by the twelve "houses" — twelve 30-degree sections of the total space surrounding the place of birth, above and below the soil, extending to theoretical infinity. The line of horizon is the basic line of segmentation. It defines two realms of experience, two phases of development of consciousness: the below-the-soil realm of strictly individual awareness, and the above-the-soil realm of social and outer awareness — the invisible and the visible, that which is conditioned by the self and that which is conditioned by the not-self (the world of sensations and of relationship with others). A detailed study of these twelve mansions of the individual soul, as it slowly forms and establishes itself as a complex of memories and anticipations, has been made in our previous work, The Astrology of Personality. We have shown that there are two methods of approaching the cycle of these "houses": a static and timeless one according to which man's complete field of experience is analyzed into twelve separate departments or modes of activity — and one which follows up step by step the development of man's awareness of life, linking every progressive phase to the preceding and the following ones and presenting a view of the process of soul-development as it unfolds through the series of experienced moments. This last mentioned approach is much the more fruitful and the better fitted to the type of thought which characterizes our century. It deals with the material of experience and with the actual focus of man's consciousness as it shifts from one phase of life to another. It reveals to us not an abstract realm of intellectual formulas but a living whole of experience, constantly and continuously readjusting itself to new needs and new goals, dimly perceived yet eagerly fought for. It is this approach which will yield to us new symbols for the twelve mansions of the self: symbols which are the products of actual organic and social experience, symbols which should enable us to gain a new and fresher perspective upon a cyclic process which is hoary with age yet ever as young and mysteriously virginal as those who tread with immature steps the path of living. This path does not extend its reaches in a straight line. Every living process is essentially cyclic. Wherefore we must postulate the existence of various "levels" of being and experience. It is true that all men live upon the same earth and, whether they be young or old, foolish or wise, eat much the same food and perform much the same necessary actions for the perpetuation of their physical organisms. But to that physiological level of experience another may be added, and perhaps yet another. Man's mind and soul operate in ways which, if not independent from physical realities, at least have a definite rhythm of their own. The individual may live, as an individual, a psycho-mental life free within certain limits from the pull of the earth. Even if constrained by physiological needs he can center his consciousness in a realm in which these needs have an utterly transformed significance and are seen in a new light. New needs arise. The same basic symbols may apply to this new level, but transfigured by the new light and the new realizations. Indeed — and this is the proof of the validity of the symbols — they do apply to all levels, for life is unalterably one. But man may face it in different ways, from different levels. The reality is the same, but the truth about the reality differs on every level. Facts are the same, yet the light of a new meaning makes them almost unrecognizable; for man's world is essentially a world of significance, and thus man creates his own world as he deliberately gives to old forms new meanings. It has been shown elsewhere that the archetypal span of man's life in terms of individual consciousness is 84 years, or three cycles each of 28 years. To these three cycles correspond in a general manner three levels of man's development as a conscious self. At the beginning of each of these cycles man experiences — theoretically — a birth. To the physical birth corresponds thus, at the age of 28, a psycho-mental or "second" birth, and at the age of 56 a spiritual or "third" birth. The first 28 years represent the physiological part of man's development. Man functions primarily as a racial being, in terms of heredity and geographical-social environment. His experiences are conditioned mostly by the collective norm, and if he sways away from it, it is because of the pressure of wrong and unhealthy conditioning, of psychological maladjustments and bodily illness. On the basis of such abnormalities and of more or less conscious inner urges welling from the past, man achieves a certain amount of distinctiveness. He becomes different from the norm. He may thus emerge from the collective womb of his race as an individual. Theoretically this second birth occurs around the 28th birthday. If it does — and in most cases it does not and man lives his life as a collective being barely differentiated from the mass — then the individual slowly establishes himself at the psycho-mental level, operating there as an individual, learning from individual experiences, giving to all things a significance really his own; learning also to utilize his very complexes and abnormalities so as to break through the boundaries of the mass-mentality and to discover new angles of vision — finally realizing that these new angles are not to stand against the normal ones but should rather complement and vivify them. On the basis of this new and mature understanding the individual may grow into the higher realm of the spirit, when he finds those "who belong to the same brotherhood", those with whom he forms a higher collectivity of the Spirit founded on individual selfhood, and no longer — as at the racial level — upon a common physiological ancestry and a tribal tradition conditioned by blood and climate. This "third birth" is only a potentiality which a very few indeed really experience. Yet the trend it represents is more or less felt by those individuals who, after the years of maturity, face life in a broader and less separative way; who serve their race or their ideals with a wisdom accumulated from the tragic struggles of the period of individualistic focalization. These three 28-year periods and the levels of conscious focalization to which they have just been correlated are obviously rather theoretical and abstract. In the living experience of living men there are no sharp lines of demarcation, and cycles in the individual may not necessarily fit in with the above-mentioned generic ones. Nevertheless, the formulation of such cycles is as valid as the assignment of a definite age to physiological crises of growth such as puberty and the change of life. All that is necessary is to think of such cyclic figures in terms of a living process never rigidly to be measured by yardsticks and clocks, but always to be experienced through identification with the surge of the Life-force which is the reality and substance beyond or within all manifestations of consciousness and of selfhood. As we move in thought through the twelve stations of the path which to many is known as a via dolorosa, yet which should be realized instead as a glorious process of life-metamorphosis leading to the birth of the Living God within our illumined Soul; as we touch upon symbol after symbol and see them unfold in significance from level to level of understanding, we must never lose touch with the reality of our living experience. We must ever let the symbols live within the actuality of our quest for richer living. They are not dead butterflies pinned upon the pages of a curiosity-seeker's album. They are live seeds. They would be futile indeed, and all this would be in vain, if men and women here and there, in all lands, were not to glow more brightly and live more understandingly with the fire and the wisdom that these symbols have stirred within their souls.